SATURDAY SADWRN 7 RHAGFYR DECEMBER, 10:00, 105 minutes. Join us on an encounter with the Un-world of the wild west of Wales, as we discuss the roots and branches of folk tale, art and music in our seasalty land. Peter Stevenson, forger and liar, will begin the morning with a look at the nature of storytelling in west Wales, and the role of the storyteller as creative artist, taken from his impending book. Ceri Owen-Jones, jazz trombonist and harpist, will talk about the fairy tale and folk song collector Myra Evans, how she wove her stories into the landscape, and how he and Elsa Davies have restored Myra’s manuscripts into the show that was performed on Friday. Christine Cooper, fiddler and tale teller, will discuss the medieval Welsh poem Cad Godeu that inspired her to create the Battle of the Trees, also seen on Friday, the story of the Great Storm of 1987 that destroyed six of the Sevenoaks of Kent, leading to her thoughts on the Ecology of Storytelling. Mary-Ann Constantine, writer and folklorist, will talk of her encounters with Lake Ladies in her new book All the Souls, and the role played in the stories by the collector Sir John Rhys, a boy from Ponterwyd who became professor of Celtic Studies at Oxford. Ceri Rhys Matthews, piper and flautist of Fernhill, will spontaneously round up the morning talks, and chat about his own thoughts on the connections through time between the Welsh landscape, people, and their gossip. Then join Ceri at 4pm as he rambles through more tunes and tales. Mary-Ann will offer a talk based around the various versions of the lake-story known as Llyn y Fan Fach, with a reading from her new book, Lost Souls. Ceri Rhys Matthews plays flute, pipes, guitar and sings. He works in a duo with fiddler Christine Cooper, and in the band he co-founded, Fernhill. He has released a CD of flute music and spoken word, called Yscolan. He has initiated and teaches music at two connected long term self-funding projects; Pibau Pencader / Prosiect Ioan Rhagfyr Dolgellau. He has established a series of residential music retreats at Pentre Ifan in west Wales, also called Yscolan. He teaches part time at the folk and traditional music bmus honours degree course at Newcastle University. He works as an independent record producer and has produced nearly twenty five CDs for Fflach:tradd, World Music Network, Beautiful Jo Records, and Smithsonian Folkways. Peter Stevenson is a storyteller, children’s writer, book illustrator, folklorist, purveyor of Magical Lantern Shows, concertina and banjo player, organiser of the annual 3 day Aberystwyth Storytelling Festival in collaboration with Aberystwyth Arts Centre, and runs Stories by Gaslight, a storytelling club that encourages collaborations with visual artists, musicians, dancers, puppeteers. He has illustrated, compiled and written over a hundred children’s books, travelled the country with storytelling shows for adults that use hundreds of projected illustrations and live music, has just finished collecting and writing The Ceredigion Folk Tales for the History Press, and tramps the roads with mud on his boots and his head in the clouds. Peter is an associate partner with Aberystwyth Arts Centre. 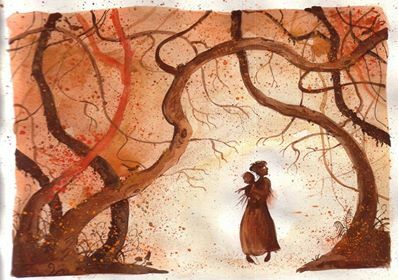 Peter presents an encounter with the roots of storytelling in Wales through the work of folk tale collector, storyteller and illustrator Myra Evans. He discusses how fairy tales are closely connected to the landscape of the teller, the community, and the geographical landscape, how the teller adapts the tales to their own external and internal landscapes, and how this landscape can be transplanted from telling to telling. They have performed in Wales and abroad, including Western Canada where last winter they toured, taught and went ice-skating. Ceri works regularly with Julie Murphy of Fernhill, and with Elsa in Cerddcegin and Corelw. Ceri and Elsa offer a workshop on the structured use of music and song in storytelling, having restored the songs and music from the songbooks of Myra Evans for the show based on Myra’s stories, Sigl-di-gwt. They will focus on the strong connection between the music, landscape and performer, and the intuitive of the landscape and people through the music.